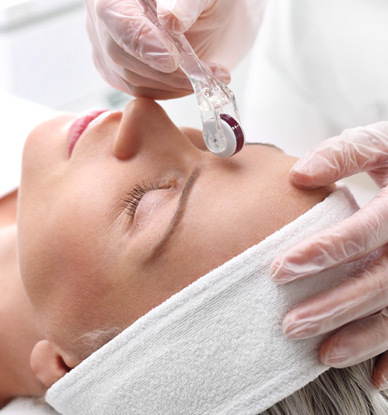 Why have a Microneedling treatment at Therapy House? If you would like to improve the appearance of scars, pigmentation or large pores, or give your skin a much-needed boost, then you may benefit from a micro-needling treatment. Micro-needling devices work by harnessing your body’s innate ability to regrow and repair skin as a response to micro-injuries. By creating tiny channels in your skin that close in a matter of minutes, we can stimulate your skin to create collagen and elastin, which will improve your skin’s health, tone and texture. Here at Therapy House, we use both the GenuineTM Dermaroller and the Dermapen to create proven results. The micro-needling devices we use enable us to create a treatment that’s completely unique to your skin. Both the GenuineTM Dermaroller and the Dermapen are tried and tested tools to rejuvenate and tighten, improve texture and skin tone, and even reduce your fine lines and wrinkles. How does skin micro-needling work? Skin micro-needling devices work by creating tiny micro-injuries in your skin using a series of micro-needles. As the needles enter your skin, they create miniscule channels for cosmeceutical products and water to be drawn deeper into the dermis. This boosts your skin’s hydration. At the same time, your body will respond to these micro-injuries by creating collagen and elastin to heal them. Studies show that the micro-channels close by themselves within 10 to 15 minutes, leaving no visible injuries, but this is enough time for your body’s natural healing response to kick in. In the days and weeks after the treatment, this increase in collagen and elastin will help to improve your skin’s texture, tone and colour. The Dermapen is a handheld fractional micro-needling device. It looks like a pen, but has a single-use tip containing 12 micro-needles that can be adjusted to different speeds and depths depending on where on your face we’re using the Dermapen. The fragile skin under your eyes, for example, would need a shallower depth needle that the skin on your cheeks. You can read more about Dermapen treatments here. You may begin to notice changes to your skin approximately a week after your treatment, but the full results will be evident after six to eight weeks. You should see the results from your skin-needling treatment for months afterwards. You may need a course of several treatments to best address problems such as acne scarring or hyperpigmentation, but we will discuss this with you at your initial consultation. Every person is different. After your initial treatment sessions are complete, you may want to book a top-up skin-needling treatment every six months to maintain your skin’s refreshed and rejuvenated appearance. The side effects of a skin-needling treatment are mild and self-correcting. The most common side effects are redness, stinging, itching and skin tightness for 24 to 48 hours post-treatment, after which the symptoms should subside without intervention. Although most people find they can carry on with their day as usual, you may want to arrange your treatment for a day when you can go make-up free or take some downtime in case your skin looks red for 24 to 48 hours afterwards. Want to know more about Accent XL Radio Frequency?